"Bringing Music to People and People to Music"
Now in our 34th season of ‘bringing music to people and people to music’, the Hanover Wind Symphony announces its new lineup of exciting performances. Our season opens on Wednesday, October 24 with Songs from the Heart at our home venue, Memorial Junior School in Whippany featuring our music scholarship winner flutist Claire Oplinger of Morristown. Join us for a post-concert reception to meet all the players. Join us at the Mayo Performing Arts Center in Morristown at 3 PM on Sunday, November 11 for a star-spangled salute to veterans. We honor and celebrate those who serve and have contributed to our nation's defense. Mark your calendar for Sunday, December 9 for our annual holiday concert A Christmas Presence at Our Lady of Mercy. It has become a Christmas tradition for both our audience and members. On Sunday, February 10, it’s back to the Bickford Theatre at the Morris Museum in Morristown for "And the Trumpets Shall Sound!" Visit the trumpet exhibit at the museum and then hear us perform music featuring our trumpet section. We are honored to be selected to perform at the Association of Concert Bands conference at the Woodcliff Lake Hilton on Wednesday, April 24th. Join us Wednesday, May 15 for our Outreach Concert at Hopatcong High School. We’ll be inspiring the next generation of adult musicians. We're back home at Memorial Junior School to kick off our Summer Gazebo Concert Series on Wednesday, June 26th. We end our 2018-19 Concert Season at Ginty Field in Morristown on Tuesday, July 9th. The Hanover Wind Symphony supports the Americans with Disabilities Act. Funding has been made possible in part by funds from Morris Arts through the New Jersey State Council on the Arts/Department of State, a Partner Agency of the National Endowment for the Arts, and the Cultural Arts Committee of Hanover Township. The Hanover Wind Symphony is honored to perform at the 2019 Association of Concert Bands Convention. This is an outreach concert of the Hanover Wind Symphony with the Band Program at Hopatcong High School. Join us at Memorial Junior School to kick off our Summer Gazebo Concert Series. Hanover Wind Symphony supports the Americans with Disabilities Act. This school year’s theme is “All Music. 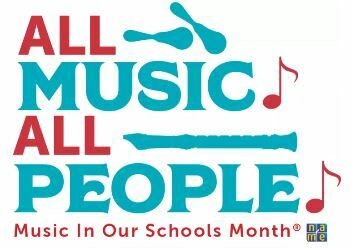 All People.” and focuses on bringing all kinds of music to all students. Announcing our 2019 Summer Music Scholarships! HWS is proud to announce our 2019 Summer Music Scholarships! 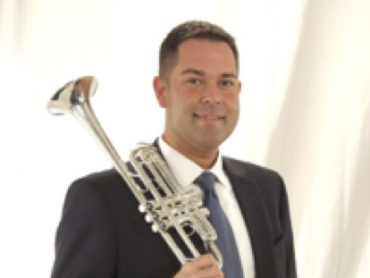 Michael R. Baker will be the cornet soloist with the Hanover Wind Symphony for their concert "And the Trumpets Shall Sound" at the Bickford Theatre at 2 PM on Sunday, February 10, 2019. The Hanover Wind Symphony loves bringing music to people and people to music! You can enjoy live music performances without having to leave the Morris County area. What makes it so much fun for us onstage is seeing you in the audience, enjoying the music with us. Your past donations have played a vital role in keeping the arts alive in your neighborhood and giving our talented musicians a stage on which to display their passion for music. Our 34th Season Bringing Music to People and People to Music!